Good bye Standard, Welcome to the world new Standard. For those that are not MtG peeps, let me sum up standard in a nut shell for you. Standard is is a rotating constructed format made up of the last few MtG sets of Magic cards released. 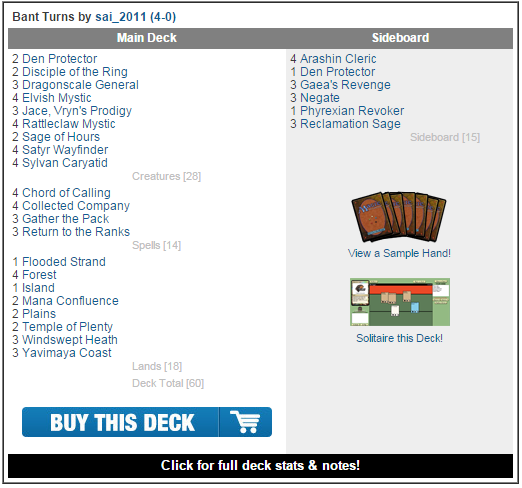 It is important to Magic players because it is the most popular MtG format as well as the format of choice for most of the Magic tournaments that happen. Most of you know i am not a build copier, i tend to build my own lists or if i do take someone else’s lists i tend to adjust for my personal tastes, be that in Magic or DDo. I might be growing up, as in the last little while now i have both followed someone else’s DDo build as well as more or less copied someone’s deck list. This bad boy below is what i played at this last week’s FNM. The last FNM for the old Standard. It was a lot of fun and other then card availability i wouldn’t change a thing in the main deck and other then adding a bit more creature kill the sideboard, the deck was great. I only lost to my son’s blue artifact deck that he played for most of the old standard season. Attacking 5/5 flyers on turn 2 is tough for anyone. But that is the past, time to start looking at the now. This morning i saw the following MtG deck list posted on one of my local area MtG groups. I feel that this deck is a good example of what we might see this first week of the new standard, at a local level in any case. With what we call fetch-lands and fetch-able dual lands, mana bases are about to get all shook up! Que the Elvis music. People dipping their toes in the water to take advantage of this powerful option to cast the most powerful spells in the format but falling short as to when they want to cast those spells or not building on the synergies to the fullest. For example in this dragon list above why wouldn’t you adjust the mana base to support the green dragons also? Dragonlord Dromoka and Atarka are truly monstrous ladies to have in your deck. Harbinger of the Hunt also can do a lot of work where why would we have so many cards with a double blue casting cost in the early game? With this mana base you have to jump a lot of hoops to have double blue mana when you need it. Let alone double white and double red for planewalkers that are good some of the best in stardard but not the most synergistic. Where Sarkhan Unbroken, is insane here. Draw a card make a mana of any color a few times and then get all your dragons and swing for the win. Yeah think i would be 5 color dragons if i was going to play this style of deck. But it is not good this week. What do i think will be good this week? Fast agro, like black/white warriors. The boy is working on a green/white mid-range beat down deck with the option to gain huge amounts of life to win via Felidar Sovereign if attacking with 5/7 dragonlords is not good enough, i think he is on to something assuming he can live to cast his 6 drops..
My point (if i have one) is everyone wants to be cute the first few weeks. If you want to attack this be fast and reliable. Winning on turn 4 or 5 with 2/1s and removal for early blockers will win more games this week then cute 4 or 5 color dragon decks that will get there on turn 8-9. Have fun, play what you like but most people have more fun if they are winning then they do when they were 2 turns away from winning when they die. ← FeyBuckler?!? I don’t even know Her!